After a limp start to plc life, Just Eat's shares have hit tasty new highs. Just Eat’s shares are positively sizzling right now after the online takeaway ordering platform delivered third quarter orders up 51% on a like-for-like basis. The London-listed company had a distinctly lukewarm start to life as a plc: shares listed at 260p in April, but tanked as low as 197p in May as investors took stock of a rash of over-enthusiastic IPOs. Today they’re up an edible 1% to 310.5p. 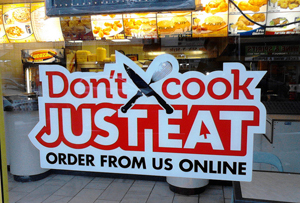 Just Eat’s total orders were up 56% in the three months to September 30th, when orders from its French business Alloresto.fr, in which it now has an 80% stake, were factored in. It also said it now has a 25% share of a new joint Brazilian venture with local outfit iFood. Just Eat did admit that the strong results were partly down to a weak summer last year, when people held off ordering hot takeaways in the heat wave, but said it had ‘underlying strong momentum’. The company’s naysayers, including MT columist and serial entrepreneur Luke Johnson, have argued that its brokerage model (taking 10-12% of the order price in fees) is unsustainable, particularly given how small the takeaways are that use it. It doesn’t look even close to coming off the boil just yet, though.